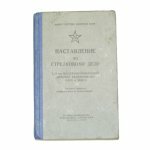 We have a handful of Russian AKM AKMC manuals, 1967 printing or version. 167 pages filled with everything you need to know about the AKM (it is in Russian). Throughout there are quite a few drawings so it can be a valuable addition even for us English speakers; not to mention a great collectable to compliment your AK47 collection. We photographed the worst manual we have; the rest are much nicer than pictured.